Young children in grade school or middle school usually have little or no concept of how products are made, distributed, marketed and sold. They also lack much of an idea about how money itself is made, stored and distributed. You can have a fun, and usually inexpensive time helping them learn by showing them companies, factories and banks in action. Depending on your child’s age, you can take official factory tours of a variety of businesses, or you can make up your own tour and tailor it to your child’s interest, age and knowledge level. Starting with your local stores, make up a tour and give it yourself. Weave in lessons about where the stuff on the shelves comes from, who puts it there, how it is marketed on the display. Have them do price comparisons between different brands and generic brands. Let them pick a product to research, then next time you go, have them tell you all about where it comes from, what company makes it, how much the company makes, and etc. Even though you take your kids to the grocery store or Walmart every week, using it as a learning ‘tour’ with a narrative designed and presented by you will open their wee little eyes to new information! Teach kids about different types of jobs in one business. At a local McDonald’s or other favorite spot of your child, first arrange a tour with the manager and during or after the tour, have your child talk about the different tasks they saw people doing. Even if you can’t get a tour, you can watch from public areas and also discuss this. Talk about what each person is doing, such as taking the orders, entering them into the computer so the people filling them know what to do, taking the money, making the french fries or hamburgers, sweeping the floors or cleaning the bathrooms. Talk about how the food gets to that location, and the jobs involved with that. Teach kids about different industries. Find factory and business tours in your area or in area’s you plan to visit to show your kids how different products come about and how those products make money for the businesses involved. Boeing offers a tour in Everett Wa (kids have to be at least 4 feet tall). I have been on this tour and it is intriguing! If you visit Pennsylvania, you can tour the Crayola factory in Eastman or the Hershey factory in Hershey. In Kansas City, your kids can learn all about the greeting card industry at Hallmark. Take your first grader and above to see how cars are made at the Toyota factory in Georgetown, Kentucky. Teach your kid about banking and currency creation. You can tour several federal reserve banks in different parts of the company. Some are open to multiple ages, others are geared more towards high school and above ages. In Kansas City, all ages can visit the Money Museum. Richmond Virgina’s Fed has a tour called The Fed Experience. In California, those 16 and older can take a tour in either San Francisco or Los Angeles. If your child is 16 or older, they can tour the New York Fed vault. 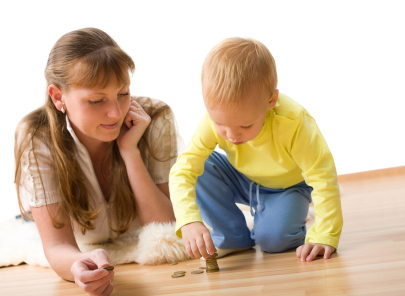 Showing your child first hand how currency and coins are produced can generate lots of discussion about money and finances. In Washington DC, the Bureau of Printing and Engraving offers tours. Mint tours are available for those 7 and older in either Denver or Philadelphia. Last year, FinCon12 in Denver offered the Mint tour and I went on it. Pay attention to instructions for these Federal Reserve and mint tours. Security measures include (at some locations) not taking any cameras or bags (including purses) into the building and of course, going through those darn scanners. There are many, many field trips and tours than can be used to help your child learn about money and finances, especially with your active preparation, involvement and followup. Google lists some on their St. Louis HomeSchoolers site. Online tours and activities are an alternative if you can’t visit in person. Show and tell your child what you are doing when you sell or buy an item on eBay, for instance. Explain how you are paying for the item, how the money flows from your bank to your account to the seller and how the site takes it’s cut. Show how the items get listed (perhaps even listing a toy or some object of theirs to sell) and how to tell how many viewers and watchers and bidders there are. Let them help package it up and mail it when it sells and etc. Studies have shown that people, including children, learn best when as many of their senses as possible are involved. Taking your child to see, hear, touch, smell and possibly even taste the environment in which a product is made – while actively involving them physically will help them learn not only economics but also personal finance. Seeing the nation’s banking system first hand and watching money being created before their own eyes will make an impression no text book or video ever will! What kind of field trips or tours have you done with your child to teach them about money? I completely agree! The key is to teach children young to help them grow. Although I do not have any children, I have two beautiful nieces and I try to introduce new things and ideas to them. Even if it is something as simple as reading the local newspaper and comparing prices for toys. I find that when you teach them young they are more prone to adapting in the future. One of the beauties about teaching others is that you always learn something new yourself while doing so. Some great ideas, Maria, for starting the foundations of financial responsibility early. Great post! There are lots of others on my blog! We took our kids to work before it was fashionable! My children saw what I did and what my wife did on a regular basis. I often took my kids to work and so did my wife.I used to include my kids in my business (restaurant and income property). We also to them to the Children’s Museum where they had hands on experience with a variety of businesses and careers. e took them to Fire Department open house too. Krantcents that is great. My employer didn’t allow kids at work, even after the day was official, but I arranged for my college freshman to do a practice interview at lunch with some business associates! Both kids ended up in my profession anyway, so I guess I talked it up enough at home. Great stuff Marie. It’s good to teach kids about the value of money and hard work since it will create a good impact on their young lives and it will reflect on the decisions they make when they get older. Thanks! I have a bunch of suggestions in my Grandma Money Camp section on familymoneyvalues. Awesome ideas! I will remember this as I am out and about with my kids! This is a great article. I have a kid myself and instead of fairy tales, I do agree that it is better to teach our kids real life stuff that they will be able to use later on. Thank you for this article. Fairy tales have their place as well, but teaching about finances is important.